THE Newman Government will seek a mandate at the next election to sell or lease $33 billion worth of Queensland assets, despite the results of a survey showing residents were opposed to the idea. The measures were announced by Treasurer Tim Nicholls in the 2014 State Budget. After spending $6 million on its Strong Choices campaign to lay the groundwork for the controversial move, the government has committed another $5.2 million to develop its draft and final plan - including consultation and advertising. Power generators CS Energy and Stanwell, worth about $3 billion, would go up for sale along with Sunwater's industrial pipelines. The government would offer the Gladstone and Townsville ports, and the Mount Isa to Townsville rail line, worth about $1.7 billion, up for long-term leases - up to 99 years - in return for an upfront payment. Private sector investment would be sought for poles and wires infrastructure through electricity providers Powerlink, Ergon and Energex, which could pocket a potential $29.1 billion. As the State Budget 2014 forecast includes asset sales, do you support asset sales to pay of State debt? But the government would retain 100% ownership of ordinary shares in the three network businesses. The government also proposes selling the retail assets of Ergon Energy Queensland which it says will enable regional Queenslanders will finally have access to a competitive retail market instead of being tied to Ergon Energy. The total value of the state's assets is about $291 billion. The assets proposed for sale, lease or private sector investment represent about $33.6 billion on a book-value basis - about 11.6% of the state's total assets. The LNP proposes to use 75% of the proceeds or $25 billion for debt reduction and 25% of $8.6 billion to invest in future infrastructure, particularly in regional areas. If the asset changes happen, rural and regional roads will get $1.5 billion and there will be $700 million put into a rural and regional economic development fund. Another $1 billion will be split between a dollar-for-dollar council investment fund and a natural disaster future fund. Some of the projects funded in the 2014 State Budget. Source: Qld Government. Treasurer Tim Nicholls said he was "absolutely convinced" this was the smartest and strongest choice for Queensland. He told Queensland Parliament during his budget speech that the "program of asset transactions" would not go ahead unless his government won the next election, expected to be held in March next year. Mr Nicholls said the program was the only way to reduce a $4 billion-a-year interest bill to $2.7 billion a year and reduce the state's debt by $25 billion. He said the draft plan would release $8.6 billion for a new Strong Choices Investment Program which would enable his government to build more schools hospitals, roads and other vital infrastructure. "None of these proposals will be implemented until the government has taken this methodical and disciplined plan to the next state election," he said. "Not everyone will agree with all the choices this government has made about how to pay for things into the future. "But at least Queenslanders now know we will have funding certainty into the future, so we can invest in the things we need for a growing and ageing population." Some of the projects fundeds in the 2014 Queensland Budget. Source: Qld Government. While the unions have warned of higher prices for consumers through privatisation of state-owned assets, the government says divested assets in other states had proved more efficient. 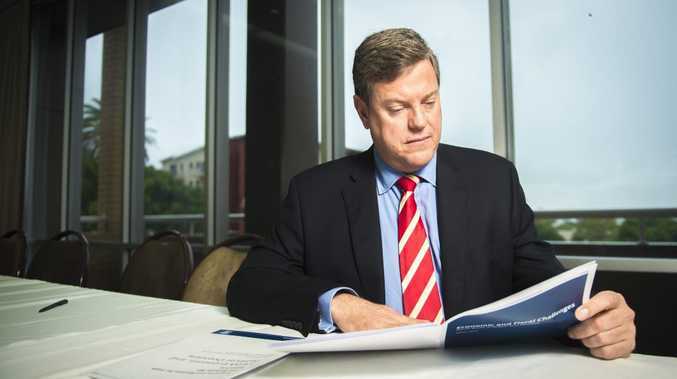 "Victoria and South Australia have already sold assets in similar markets, and their average debt per person is substantially lower than Queensland," the government's The Strongest and Smartest Choice document, released during budget lock-up, reads. The document also mentions how the NSW Government has recently entered into long-term leases of ports at Kembla, Botany and Newcastle. Mr Nicholls said his government was on track to deliver an operating surplus of $188 million in 2014-15 with the first fiscal surplus in a decade tipped for 2015-16. He said the General Government fiscal balance was estimated to be a deficit of $6.1 billion in 2013-14 compared to a forecast deficit of $7.6 billion, mostly related to Federal Government funding timings. A $2.27 billion fiscal deficit is budgeted for 2014-15 compared to $664 million in the 2013-14 mid-year fiscal and economic review. Despite being traditionally known as the spending budget ahead of election, there were few big funding bundles. "The budget I present today is not one of flashy new announcements and programs," Mr Nicholls said. "It is not a budget of big headlines or irresponsible spending sprees. "It is a budget that is right for the times." How the Queensland Government is promoting its 2014 State Budget.